Principles of Conservation Biology, Third Edition, features a wholly revised organization, emphasizing analyses of different categories of threat and approaches to conservation. Coverage has been expanded to incorporate both terrestrial and marine conservation issues, and efforts in the U.S. and across the globe. The book's eighteen chapters introduce the major themes and concepts of this diverse and dynamic field. The biological and social underpinnings of conservation problems and potential solutions are interwoven throughout the text, which is divided into three sections: foundations of the field, threats to biodiversity, and approaches to solving conservation problems. Guest essays and case studies provide a diversity of perspectives and real-world examples that add insight and provoke discussion. The text is richly illustrated, and concludes with an extensive glossary and bibliography. This book is intended for use in conservation biology courses at the advanced undergraduate and graduate levels, as well as by researchers and practitioners, and assumes a basic background in biology and ecology. 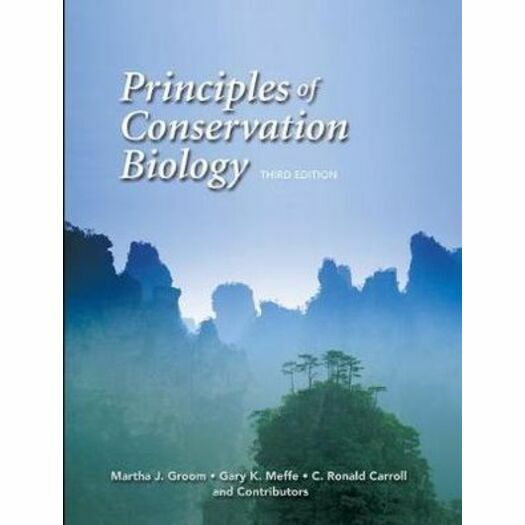 The Principles of Conservation Biology, Third Edition, companion website contains a variety of study materials and supplemental resources to accompany the textbook. Study questions, suggested readings, and Web links for each chapter help the student to master the material presented in the textbook and provide direction for further study. In addition, essays, case studies and boxes expand on the book's coverage of selected topics. Available to qualified adopters, the third edition Instructor's Resource CD contains all of the illustrations and tables from the textbook, for use in lecture presentations and other course documents. All figures are provided as JPEG files and are also included in ready-to-use PowerPoint presentations. In addition, the IRCD includes a set of suggested exercises for instructors to use with their classes.